South Korea is the epicentre of the world’s electronics industry, home to the likes of Samsung, LG, Sony and Panasonic. The country is also the world’s largest lithium ion battery manufacturer. But while South Korea is a manufacturing technological marvel, the country’s mining industry has fallen behind. So while the Samsung and LG conglomerates focus on the downstream technology, little in the way of modern resource exploration has been conducted. The mining majors also seem to have overlooked South Korea in their global quests for commercial resources – but that may be about to change. It’s in this environment that Peninsula Mines (ASX:PSM) have been exploring over the recent years, developing in-country connections and applying modern exploration techniques to previously overlooked projects. After visiting historical mines in South Korea, PSM’s geologists discovered high grade base and precious metals at surface. After honing in on these targets, PSM is now diamond drilling into the main zinc target this week. Another focus for PSM is on graphite exploration and business development opportunities. PSM is advancing large-flake graphite projects in South Korea that could supply high technology, lithium-ion battery and/or expandable graphite applications for which South Korea is the major global end-user. Forget about long haul shipping costs here, PSM’s exploration is in the same country this expandable large-flake graphite can be sold. It should be noted here that PSM is an early stage company and investors should seek professional financial advice if considering this stock for their portfolio. Having signed an offtake MOU agreement with a Korean end user, the immediate job for PSM is to complete its extensive exploration programme and define mineral resources. 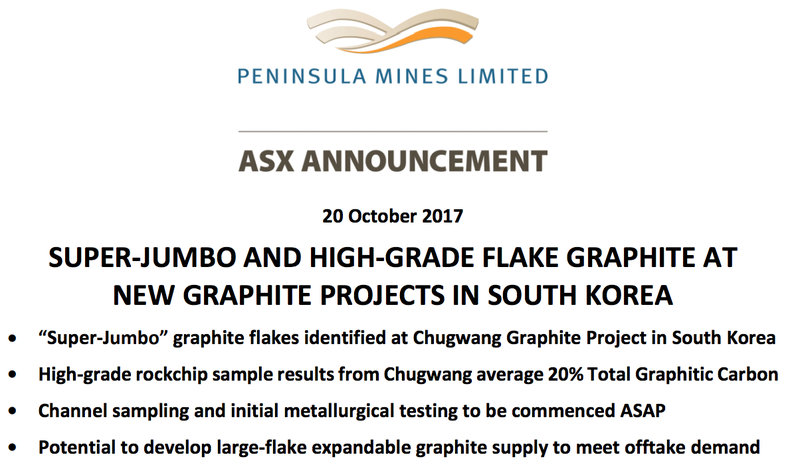 The company recently discovered Super-Jumbo graphite flakes at its newly acquired Chugwang Graphite Project in South Korea , with a fistful of high-grade rock chip samples indicating a preliminary grade of 20% Total Graphite Carbon (TGC). PSM’s offtake MOU agreement requires the supply of at least 20,000 tonnes of graphite from the mined ore PSM digs up across its multiple graphite projects in the country. With PSM currently capped at approximately A$11 million, this overlooked stock, exploring in the overlooked country of South Korea, could spark some interest amongst investors over the coming weeks and months as it drills into zinc targets and shores up its graphite business. Peninsula Mines (ASX:PSM) is a micro-cap stock that provides investors with exposure to the growing demand for energy-storage-enabling commodities, such as graphite, while also exploring for established metals copper, gold, zinc and silver. PSM’s goal is to advance its basket of projects and shore up its longer-term viability in South Korea. We last wrote about PSM in our article, ‘ PSM Commences Zinc-Silver, Copper-Gold Drilling at Ubeong’ in August, where we delved into its chances of forging a commercially viable metals empire in Asia’s Far East. A few months on, PSM’s progress has been highly positive. The particular aspect PSM is most concerned with is the ‘massive sulphide copper-gold zone’ which has previously recorded 3.8% copper in previous testing. PSM is also operating multiple graphite projects in South Korea, including Yongwon, Daewon, and the recently acquired Chugwang. It also has a zinc, silver, copper and gold project (Ubeong), and a high-grade gold-silver play (Osu). The company is potentially exploring for a wide range of commodities, but is focusing on zinc and copper at Ubeong and flake-graphite at Yongwon, as well as its newly acquired Chugwang Graphite Project. PSM’s bountiful metals potential ensures it can choose to focus on more than just one commodity as it looks to progress from preliminary exploration and drilling of exploration targets, to a more advanced stage of assessment based on potential drilling success. PSM is sitting on the doorstep of the world’s largest market for high-purity flake graphite, linked to higher lithium-ion battery use across the developed world, as well as other applications such as expandable graphite used for non-flammable building cladding and Graphene for high technology applications. If PSM progresses its graphite and metals projects as planned, this junior ASX explorer could be in a position to supply tomorrow’s graphite-driven range of products, directly to Korean manufacturers. Although it remains to be seen how much of the market, PSM can attract as it is still in its early stages, so investors should take a cautious approach to any investment decision made with regard to this stock. 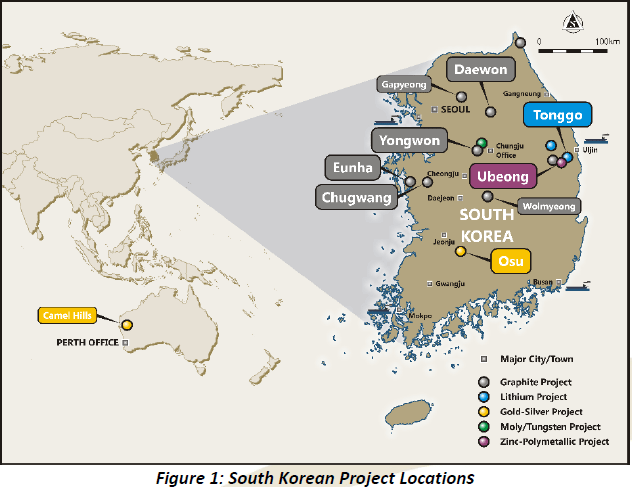 PSM has assembled a significant portfolio of graphite assets in South Korea. The overarching plan is to collate a ‘critical mass’ of graphite projects to be drilled and JORC resources defined as soon as reasonably possible. The Daewon Graphite Project and the Yongwon Graphite Project are the major graphite projects that PSM is looking to progress. Both projects have demonstrated potential for high-purity graphite (>97% graphite) concentrate production. PSM has lodged applications for four more flake-graphite prospects in South Korea which will be aggregated into a single portfolio and progressed to their maximal commercial potential with centralised processing envisaged, utilising the outstanding infrastructure in South Korea. 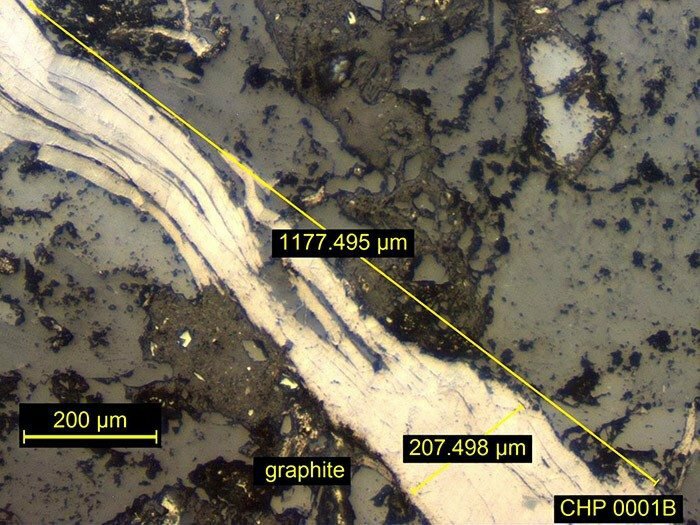 On October 20, PSM announced that petrographic analysis has identified a high proportion of super-jumbo and jumbo sized graphite flakes in petrography on rock samples from the recently acquired Chugwang Graphite Project in Chungnam Province. 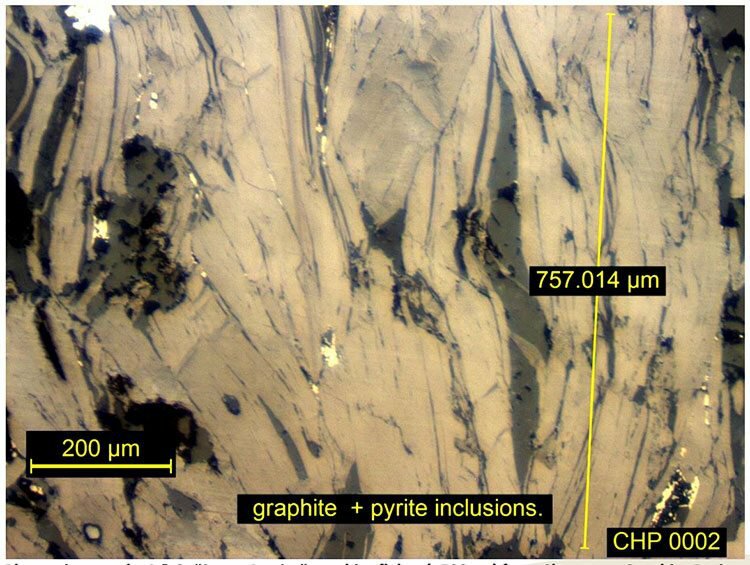 The petrography tests conducted at the Townend Mineralogy Laboratory in Perth, indicated “coarse single flakes and sometimes bunches with long dimensions frequently exceeding 750 micron and widths >100 microns”. These are significant findings and fall within the industry’s classification as being ‘Super Jumbo’ flakes. These results confirmed the project’s potential to develop large-flake expandable graphite supply. 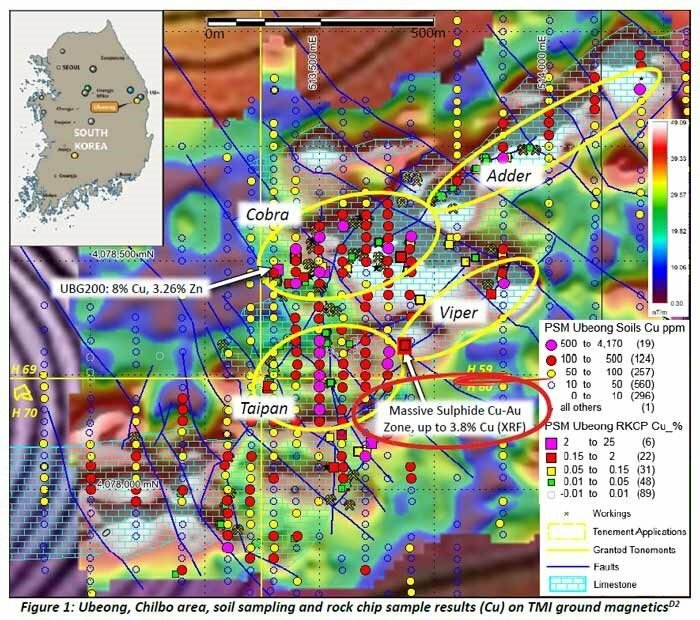 Petrography was also conducted on samples from the nearby Eunha Project, where a high-grade rockchip sample result of 19.3% TGC was obtained from a graphitic unit that previous mapping identified over a 1.3 kilometre strike length. The petrography on the Eunha sample identified ‘a minor population of >500 micron flakes with widths between 50 and 100 micron’. PSM will now look to progress mapping and channel sampling across the graphitic units at Chugwang and Eunha as soon as possible, and conduct initial metallurgical testing to determine potential for large-flake graphite concentrate production. To bolster its chances of offloading its graphite and generating cash-flow, PSM has two MoU deals in play to initially supply up to 20,000 tonnes of graphite concentrate per year initially to Korean end-users. The first deal was signed earlier this year with Graphene Korea Co., and has been supplemented by a deal with DNI Metals in August , a Canadian company operating in Madagascar. Longer-term, PSM plans to spin-off its own company called Korea Graphite Co., in order to extract and process its graphite endowment in South Korea. It is hoped that PSM can capture the entire graphite supply chain from paddock to plate, in order to maximise the commercial margins it can earn from its graphite exploration. Other news from PSM since our last update is that the company signed a conditional agreement to sell the Daehwa Molybdenum-Tungsten Project in South Korea to a Korean company, Kondo Mining Development, for a total of 600 million Korean Won (A$675,000). PSM was happy with the outcome, having monetised the Daehwa project, freeing it up to focus on drilling the Ubeong Zinc-Lead-Silver and Copper-Gold Project and advancing its Graphite development plans. The heightened emergence of high-tech industries related to power storage have given metals prices a significant shot in the arm over the past 18 months. Dozens of companies are scampering into the field to discover supplies of the elements expected to reshape modern manufacturing and industry. However, it’s the small-capped plays such as PSM that could potentially deliver the most outstanding returns to investors. Of course, this is no guarantee, and investors should invest with caution at this end of the market. 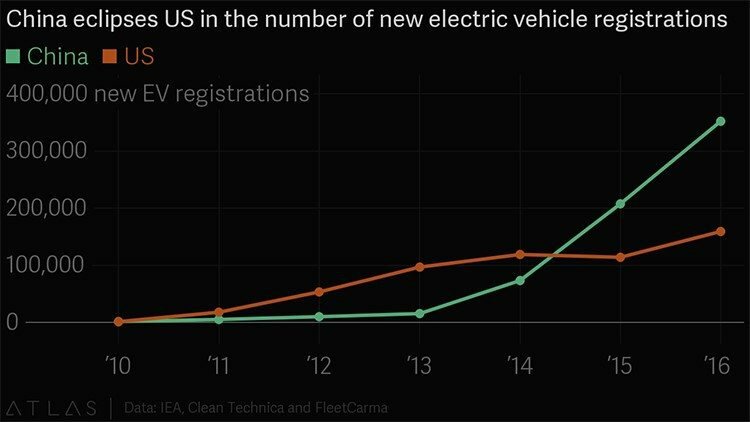 Electric Vehicle (EV) sales are ramping up in China, although also growing steadily in the US. And guess which country is closer to PSM’s South Korean projects? So while the various US-based companies stampede over themselves in an ultra-competitive market in attempts to supply Tesla’s growing empire in North America with graphite, lithium, cobalt and zinc, PSM plans on doing the same over in Asia, where there are more than a few Tesla-emulators that are preparing to build more cars than Tesla. What does this mean in relation to PSM’s projects? The ASX and TSX small cap stocks seem to have overlooked South Korea’s potential for resources – except for PSM – that spells opportunity to us. That’s why its projects are so important. PSM is operating in an area of South Korea with historical mining projects scattered across it. The Yeonhwa zinc-lead-silver project has produced around 10 million tonnes zinc, silver and lead in the 1980s. The high-grade zinc-silver mineralisation identified in the Chilbo workings area occurs towards the eastern end of the limestone skarn-unit, associated with an extensively faulted zone that has offset the unit and is interpreted to have acted as a conduit for mineralisation. The name of the game for PSM is to continue its exploration as quickly and effectively as possible, in order to potentially announce a base and precious metals discovery at Ubeong before the end of the year, then move to the next stage, resource drilling. But all eyes are on the current diamond drilling into the main zinc target, expected to occur this week. 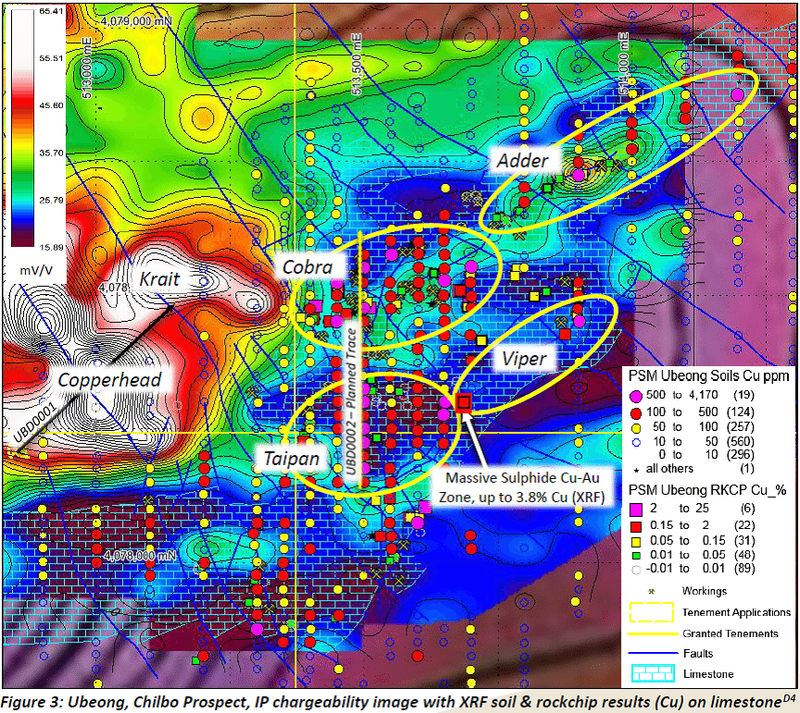 In the magnetics and copper geochemistry imaging shown below, notice PSM’s key targets, Taipan and Cobra. These two targets have outcropping massive sulphide (zinc, silver and copper) mineralisation and the IP and magnetics imagery indicates potential for buried metals mineralisation; and there are strong hopes for PSM’s drill bit to prove up something substantial with the current drillhole entering the “Cobra” zone as we write. With PSM’s drilling schedule on track, we are already quietly hopeful of some juicy catalysts, in the form of sulphide intersections, assay results, rock chip samples, geophysics reports and any other pertinent information from PSM over the coming weeks and months. With a bag of multi-faceted metals assets in South Korea, PSM is hastily progressing its array of metals projects in time for a demand spurt from steelmakers and battery manufacturers. PSM is looking to accelerate exploration initiatives right across its portfolio of projects. The company has already established, and is growing, a portfolio of graphite, lithium and zinc, copper, gold and silver projects all from the same pool. With the emergence of high-tech industries and markets, the need for high-grade zinc, copper, lithium, graphite and gold presents PSM with an opportunity to capitalise on its potential. South Korea is home to tech giants including Samsung, Hyundai and LG Electronics, all of whom currently have a need for lithium-ion (graphite) batteries to help power their cars and other high-tech gadgets. Seeing this from afar, PSM is intent on building up a metals and energy-minerals commercial haven in South Korea (bolstered by the prospect of graphite revenues down the track) to supply the next generation of energy demand, fuelled by gadgets, the Internet of Things (IoT) and electric cars.